Math Centers are a great way for students to practice skills that have already been taught. Students always need practice on basic math facts- addition, subtraction, or multiplication! This download is for the label that goes on top of the egg carton. It includes directions and a challenge for students. Two labels are printed on one page. It can be printed on 8.5x11 labels, or on copy paper and taped on with packing tape. 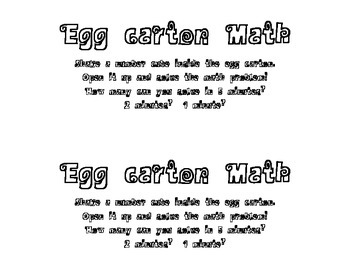 This center idea is simple- write numbers on the 12 spots on the inside of an egg carton. Place the label on the top. Add a number cube... and voila- instant math center! Students will shake, then solve the math problem inside: Number (plus, minus, or times) number rolled on dice!